Komatsu has unveiled the D375Ai-8 ‘intelligent’ dozer, the company’s first mining dozer featuring its Machine Control system. The 72.9-tonne D375Ai-8 is powered by a US EPA Tier 4 Final emission certified Komatsu SAA6D170E-7 diesel engine, rated at 455 kilowatts in forward gears and 558 kilowatts in reverse. 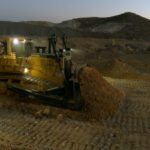 Komatsu Australia mining product manager Michael Hall said the iMC version of the dozer could carry out both bulk and final trim dozing in fully automatic mode from start to finish. While this is Komatsu’s first mining machine fitted with integrated Machine Control, the concept has been successfully used on its smaller and mid-sized dozers across Australia and New Zealand over the past three years. 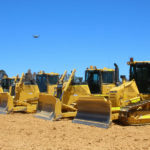 “The concept has been shown to significantly increase productivity and efficiency – up to twice as productive as dozers fitted with ‘bolt-on’ third party machine control systems according to Australian users and operators – while reducing the cost of each metre of material moved,” Hall said. 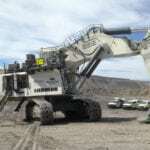 “This will deliver major benefits to mining operations across the board, whether in bulk overburden moving, chasing thin or narrow seams, for mine infrastructure works, for stockpile management, or in rehabilitation projects. In addition to mining operations, the D375Ai-8 also has applications in quarrying and heavy construction projects, according to Komatsu. The intelligent dozer incorporates a factory-installed fully integrated global navigation satellite system machine control system as standard. “Because the machine control system is fully integrated, it eliminates the need for coiled cables between machine and blade, the operator or service technicians don’t have to climb up on the machine to remove and replace antennas or masts, and there’s no requirement for daily connections and recalibrations,” Hall said. Komatsu’s integrated Machine Control system automatically controls blade elevation and tilt according to target design data, using common industry standard design data software and systems. The D375Ai-8 is based on the recently released D375A-8, which features a combination of a fuel-efficient low-emission engine, increased reversing power and enhanced chassis and track frame durability to deliver significantly lower operating costs per metre of material moved. Komatsu has enhanced the production efficiency of the machine by increasing engine power by 20 per cent when in reverse, reducing cycle time in downhill dozing applications. “Compared with our previous generation D375A-6, production in downhill dozing is increased by 18 per cent,” Hall said. The new dozer’s other features include Komatsu’s automatic transmission with lockup torque converter for reduced fuel consumption and greater powertrain efficiency, automatic gearshift transmission, improved ride and operator comfort levels, better visibility to the blade and ripper, and maintainability enhancements.